Samsung announced today that the Samsung Galaxy S3 will soon become the world's first Voice over LTE-enabled smartphone, and while we don't doubt their sincerity, the claim isn't totally accurate. MetroPCS beat Samsung to the punch earlier in the summer with the announcement of its own VoLTE service and the LG Connect 4G. Nevertheless, Samsung's announcement is exciting, and the global adoption of VoLTE service is a milestone for the industry. Samsung confirmed Thursday that South Korea will be the first market to get VoLTE services, which will launch for the Galaxy S3 through Korean operator SK Telecom in August. Telecom unveiled the service on Tuesday, but the announcement provided no hints as to when HD Voice over LTE would launch globally. But Samsung picked up the slack, revealing that the VoLTE launch in South Korea will be "followed by availability in global LTE markets." A statement from Samsung's Mobile Communications president JK Shin reads, "We will continue to work to quickly roll out VoLTE enabled products globally, providing the best LTE experience for our customers across the world." Okay, so that's still pretty vague, but at least it's coming. The adoption of Voice over LTE means call quality is about to drastically improve, finally reaching HD-quality levels wherever 4G LTE is available. And the upgrade won't require any additional apps or hardware, instead arriving through a simple software update for existing Samsung Galaxy S3 owners. 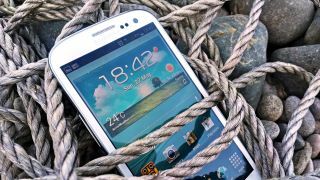 New Galaxy S3 devices will be equipped for HD Voice over LTE right out of the box, SK Telecom revealed on Tuesday. With VoLTE, even age-old issues like dropped calls and delayed connections could become a thing of the past.